Product prices and availability are accurate as of 2019-04-23 15:00:57 UTC and are subject to change. Any price and availability information displayed on http://www.amazon.com/ at the time of purchase will apply to the purchase of this product. New 18k Rose Gold Mens Maxi Marine Diver Titanium. Automatic Chrono movement. 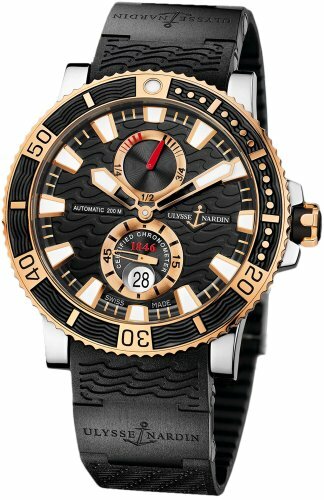 Ulysse Nardin UN26 (28,000vph, 28 jewels, base ETA 2892). 42-hour power reserve and water resistant up to 200m (660ft). Deployant rubber strap with ceramic inserts. Case is 45mm in diamter, 14.6mm thick, sapphire (scratch resistant) crystal, exhibition back (transparent, sapphire crystal). Unidirectional rotating bezel with screw-in rose gold crown.